KoolMoves is Html5 animation software that also exports as animated GIF, AVI/MP4, SVG, and SWF for animated banners, slide shows, games, animated characters, and entire web sites. In addition, it exports as mobile apps using PhoneGap and Adobe AIR SDK. It features libraries of text and image effects. KoolShow is a version of KoolMoves that lacks Flash export. KoolMoves and KoolShow are easy to use. All you do is put together something like a cartoon strip. Each frame contains text, objects, and shapes. In the case of character animation, one frame would have the characters in one pose and the next frame in another pose. KoolMoves automatically morphs drawings in between each of your drawings to create smooth animated motion between the characters. Koolmoves is somewhat unique in supporting vector shape morphing for Html5 canvas export. It has a lot more functionality than typical Html5 animation software. A rich set of drawing tools is provided: draw like you would with a pencil or draw point by point. Points defining shapes can be moved, added, and deleted. Transforms (scale, rotate, slant, squish, flip, and perspective) can be applied to selected shapes or selected points. 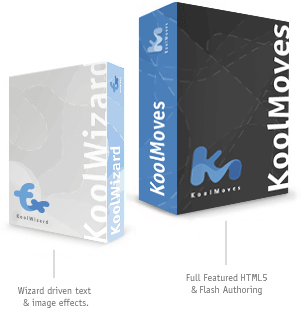 KoolMoves has been designed by a professional animator to provide powerful selection and manipulation capabilities. Html5 and SWF exports are compatible with responsive web design. An export option for embedding an animation on a WordPress page using an iFrame is also provided. KoolMoves supports Chroma Key functionality which lets you turn any single color portion of a video transparent. For example, if you shoot a video of a person against a blue screen background, you can make that person seem to float over a web page. For many decades, Chroma Key has been one of the most powerful special effects used in Hollywood. Now you can create that kind of magic for the web, right in your own home, with this very affordable software. Chroma key export is Flash only at this time. With the decline in the popularity of Flash animation, many web designers seek solutions for converting their legacy Flash animations into mobile-friendly alternatives. KoolMoves supports basic conversion of Flash to Html5 (with the exclusion of action script and components) and to animated GIF (or AVI/MP4). For those still using Flash, it supports Action Script 1 (AS1) and ActionScript 3 (AS3). And even if you do not script, AS3 gives a major behind-the-scenes boost to many aspects of KoolMoves, e.g. action-script-based effects, filters, pre-loaders, and components. Import from a rich set of graphic and video formats. SVG vector clipart which is widely available on the internet is easily imported including gradients. The clipart can be edited using the extensive drawing tools available in KoolMoves and KoolShow. It is easy to import 3D models made with others programs into this animation software. Without doing any scripting, you can import your 3D content in these popular 3D model formats: .3ds (3D Studio Max), .ase (ASCII Scene Export), .md2 (Quake II), and .obj (object 3D Wavefront). 3D model export is Flash only at this time.